2 days on a liveaboard, diving off the coast of the Similan Islands in Thailand. What an amazing experience! Special thanks to Pirate Divers in Khao Lak (piratediversinternational.com) for the great deal. As I stared off the bow of the two-story liveaboard at the nearly transparent turquoise water, I couldn’t help but grin. For the first time in about 8 months, I actually felt like I was on vacation. Anyone who reads travel blogs is well aware of the expression, “long term backpacking is not a vacation, it’s a way of life”… or something to that extent. It means it’s not always easy. Being constantly on the road and usually living off $20 per day in less than sanitary accommodations can take its toll on you. Yes, it’s a privilege, but that doesn’t mean it’s easy. Day after day of packing my bag, followed by traveling in a cramped hot train for 8 hours, followed by haggling with an onslaught of rickshaw drivers, and then unpacking again in yet another very questionable room, has taken more toll on me mentality, than any 24 hour work shift I’ve ever had as an editor. When we decided to head to Thailand, it wasn’t exactly on schedule. It was either way too late or a little too early depending on how you want to look at it. Our stay in India had grown from our original plan of 2-3 months into what was now approaching the expiration of our prized six month visas. But a couple of weeks before our visas ran out, we ran out… of energy. We’d just landed in North East India and before leaving the airport, we concluded we’d had enough of the countries colorful and exhilarating chaos and it was time to move on. So we booked another ticket that left in a few hours and headed straight for Thailand. Because our departure happened so abruptly, we landed in Thailand with no plan or idea of where we were going or what we were going to do. After landing in Bangkok, we decided we were so wiped from India we were ready for more beaches and hopefully some relaxation. This lead to the discovery that Thailand was one of the cheapest and best places to get SCUBA certified. Yes! Bucket list here we come! In less than 24 hours we found a company who was interested in hiring us to film some promotional material and after three days of awesome Bangkok fun, we were on a bus and ferry headed for the island of Koh Tao, the diving capital of Thailand. This may not be the best diving in Thailand but if you are looking for any type of certification, this is the place to do it. Best price and best instructors. We had arranged a deal with Simple Life Divers. They have great prices although you can find some schools a little cheaper, but DO NOT compromise when it comes to getting certified. These guys really know what they are doing. Whether you are looking for your basic Open Water or want to become a Dive Master/Instructor, they offer it all. The island is a great place to hang for a week. At Simple Life you’ll spend your day on the boat learning and the evenings downing beers at their bar with fellow students. They say bathing in Windex is good for the skin. A week later I'm sitting on this liveaboard thanks to Pirate Divers, floating next to the beautiful and remote Similan Islands (about 60km off the coast of Khao Lak), and I can’t believe what I’m seeing. The photos are real. This is the ACTUAL color of the water. And I’m living on this boat for two days, eating amazing thai food and doing three dives a day (sunrise, midday and sunset). We’ve seen a lot in our travels; from some of the most exotic deserts, to the highest altitude villages in the world. But none of it is comparable to what’s deep in the sea. The experience is unlike anything we else. To be able to breathe where you shouldn’t breathe. To swim amongst some of the most beautiful and exotic creatures you will ever see, we were completely mesmerized by this new world. For 50 minutes you’re an astronaut on an alien planet. We are beginners. Only certified to dive to 18 meters but we can’t wait to dive more. 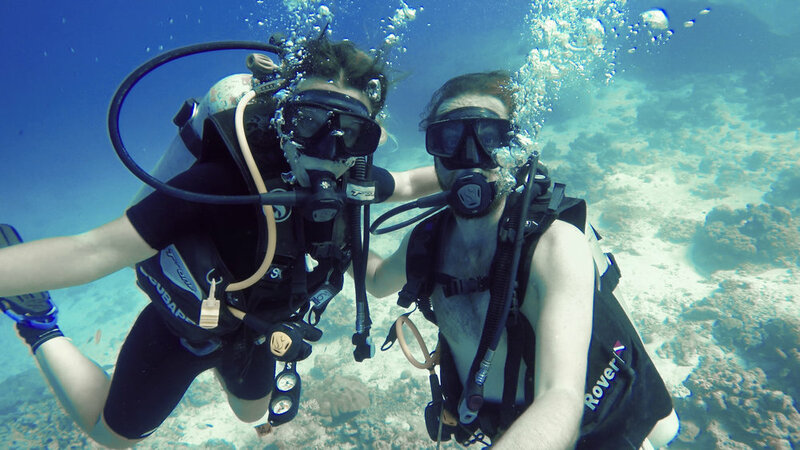 Whether it be a PADI or SSI certification, we can’t recommend exploring this world enough. From now on, wherever we go, it’s not just about exploring the above, it’s also about seeing what’s below and we can't wait.